The GOT writer used Hadrian’s Wall as his inspiration for the Wall in the TV series. This fictitious wall is a colossal fortification which stretches along the northern border of the ‘Seven Kingdoms’. It was built to defend the realm from the ‘wildings’ who live ‘beyond the wall’. It is reported to be over 700 feet tall and is made of solid ice! Having stood on the highest parts of the middle section of Hadrian’s wall in wet weather, I can understand the connection. 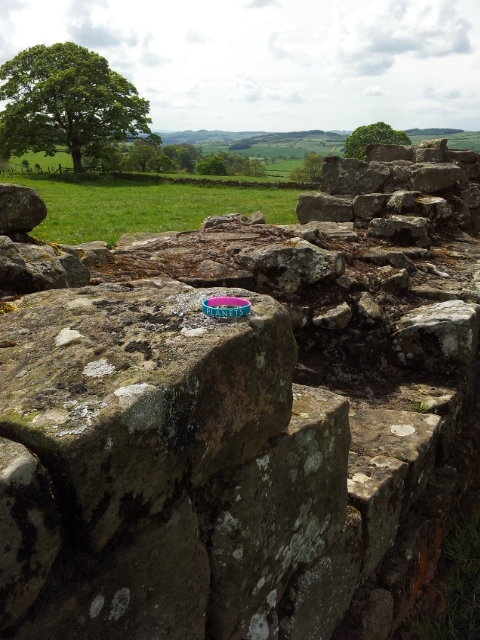 However, one of the interesting observations I made during the walk was that some of the milecastles (small forts) had a north and a south gate indicating they were in fact functioning like a border control. This would indicate there was movement between north and south and I suspect a bit of ‘tax’ being paid into the bargain! I also observed that there must have been some sort of ’causeway’ to get over the man-made ditches that existed both north and south of the wall, some of which were very deep! The milecastles in the hillier middle section had natural defences to the north in the form of steep slopes downwards and were therefore most likely to be defensive positions rather than control points. 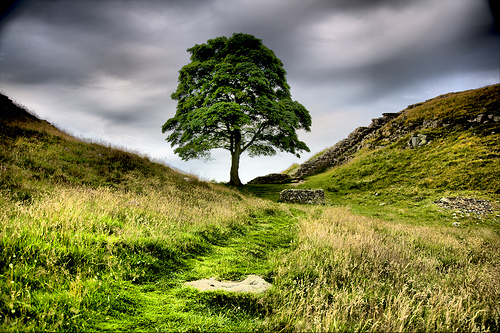 There is a common misconception that Hadrian’s Wall marks the boundary between England and Scotland. Those who say it does are either being mischievous or their historical/geographical research is flawed (or both!). 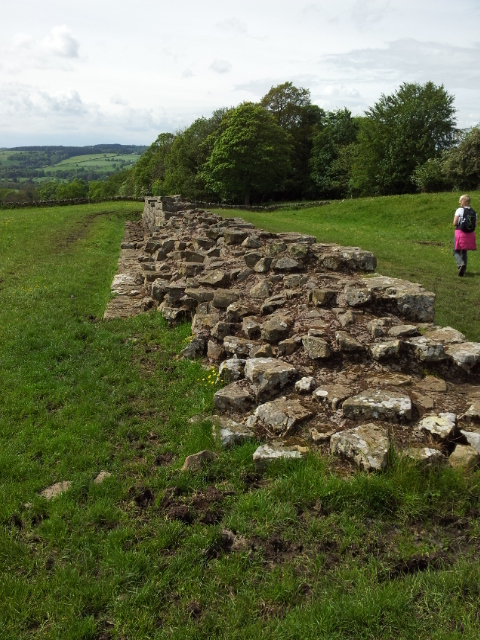 In fact, England and Scotland did not exist until 1000 years after this wall was built. 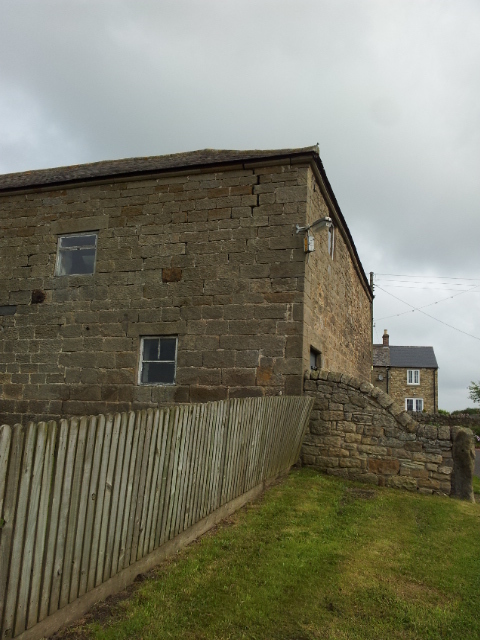 It was only then that the position of the wall was used as a ‘divide’ (which makes you think what might have transpired had there been no Roman wall…… ). The actual border lies some way to the north of Hadrian’s Wall (particularly in the east) but it isn’t marked by any substantial walls or earthworks. The medieval castles at Carlisle and Newcastle, each built close to either end of the Wall and on top of Roman forts, show how the Wall survived as a frontier structure in the 11th and 12th centuries. The period between this era and the early 18th century marked continuous struggles and wars between England and Scotland eventually leading up to the Act of Union in 1707. During the later 18th century, people to either side of ‘the Wall’ became more unified as Great Britain developed into one of the world’s dominant powers. Accounts of Hadrian’s Wall during the 19th and early 20th centuries usually played down any idea of ancient divisions between England and Scotland. Great Britain only became ‘Great’ in the 18th and 19th centuries, i.e. when the British Isles were united as the most successful partnership the world has ever seen and Scotland played a significant part in this, probably punching above its weight within the partnership. It’s a lot to throw away for romantic reasons. Scotland already has significant autonomous powers including their own parliament. Scotland already has its own culture and traditions and these are well known worldwide outside of (and regardless of) its inclusion in the UK partnership. We live in a globalised world where partnerships matter and I believe there are huge risks for Scotland going it alone. Bankruptcy was one of the reasons Scotland signed up to the Act of Union. I’m hoping the no vote wins through in 100 days time. 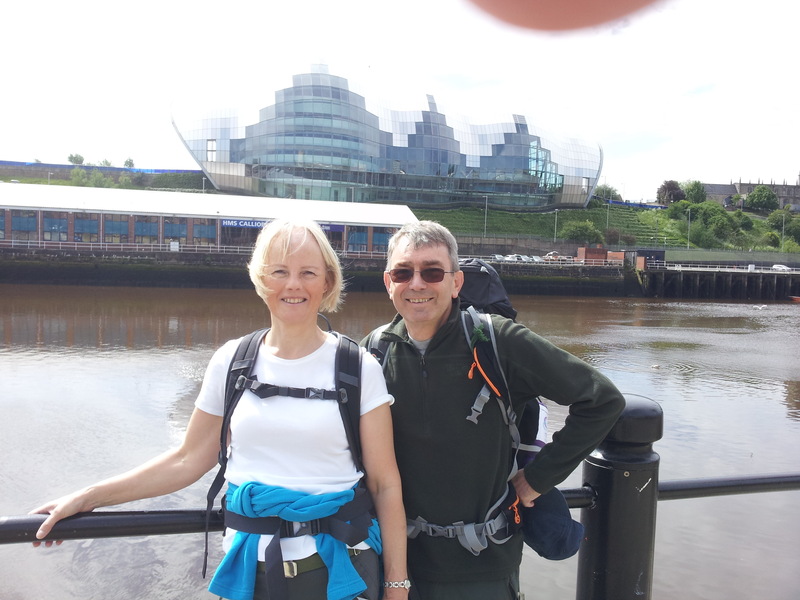 Since completing the Hadrian’s Wall challenge, I’ve started one of my testing phases with an Echocardiogram last week and an Octreotide scan early next week ready to meet with my Consultant Oncologist on 18 Jun. For the first time, I’ll also be given something called a SPECT scan which I’ll be blogging about next week. In the meantime, I might also publish some ad hoc blogs including some incidents and observations I’ve been storing up from the wall walk – so stay tuned!